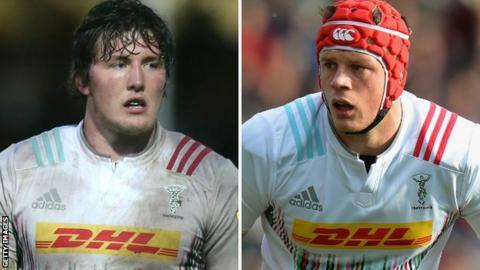 Harlequins forwards Charlie Matthews and Sam Twomey have signed new contracts with the Premiership club. Both Matthews, 24, and fellow lock Twomey, 23, came through the south-west London club's youth academy. Matthews has made 102 appearances for Quins since his debut in 2009, while Twomey has played 37 times after first featuring in 2011. "The club is fortunate to have two players of Charlie and Sam's ability," director of rugby Conor O'Shea said. "I am sure they will learn and thrive from the presence of (Australia lock) James Horwill and these two young men will be the cornerstone of this club for years to come." Harlequins have not disclosed the length of the pair's new deals at the Twickenham Stoop.